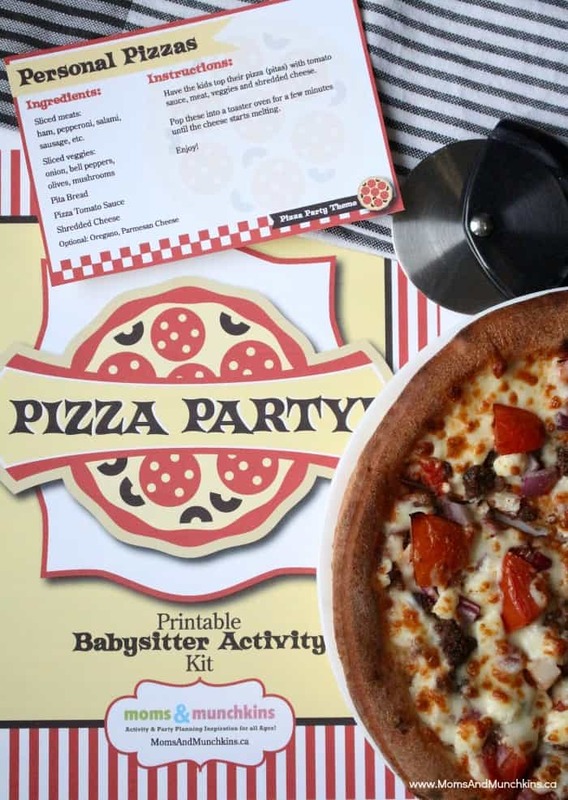 This Pizza Party Babysitter Activity Kit is great as a kit for you to take to your next babysitting job, as an activity for a night of family fun or even as Pizza Party activities for a child’s birthday. We have all the printables you’ll need for this activity over in our Etsy shop but here’s a sneak peek at what you’ll find in this kit! 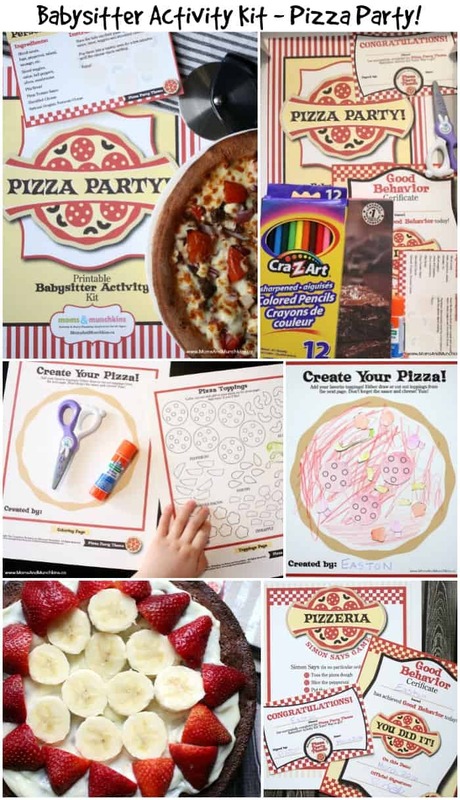 Create Your Pizza Craft – this craft is on two printable pages and includes a blank “pizza” plus pizza toppings for the kids to color, cut out and then glue onto the “pizza”. 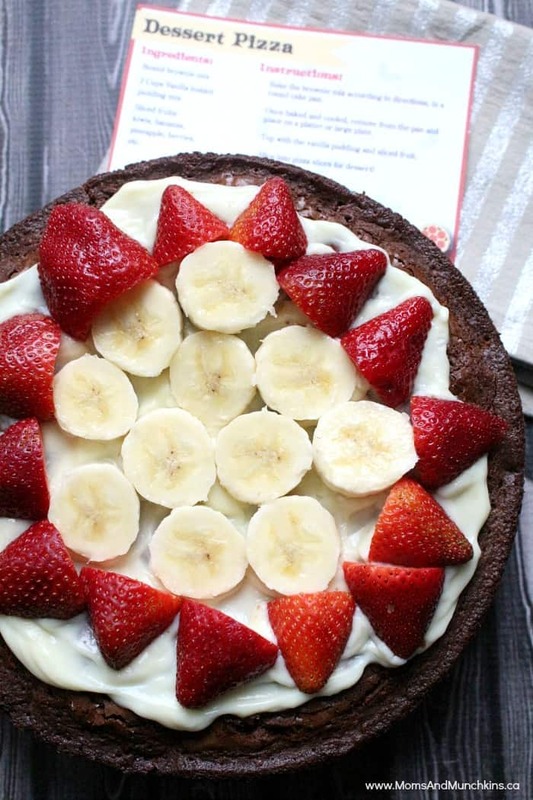 Some of the toppings are small so you may want to help the kids cut them out. 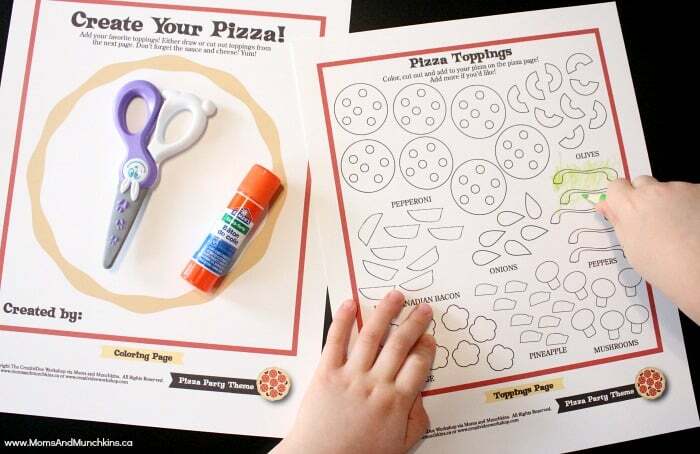 Simon Says Game – this pizza-themed Simon says game includes actions you’d do if you were making a pizza like “toss the pizza dough”. Never played Simon Says? It’s easy! The leader reads out each of the phrases but starts each one with “Simon Says”. For example, the leader says “Simon says toss the pizza dough” then all the kids pretend to toss the pizza dough. If the leader simply says “toss the pizza dough” without starting it with “Simon Says” then the kids are NOT supposed to do the action. If the kids do the action without hearing “Simon says” first, then that child is out until the next round. It an easy game that even the youngest players will enjoy. 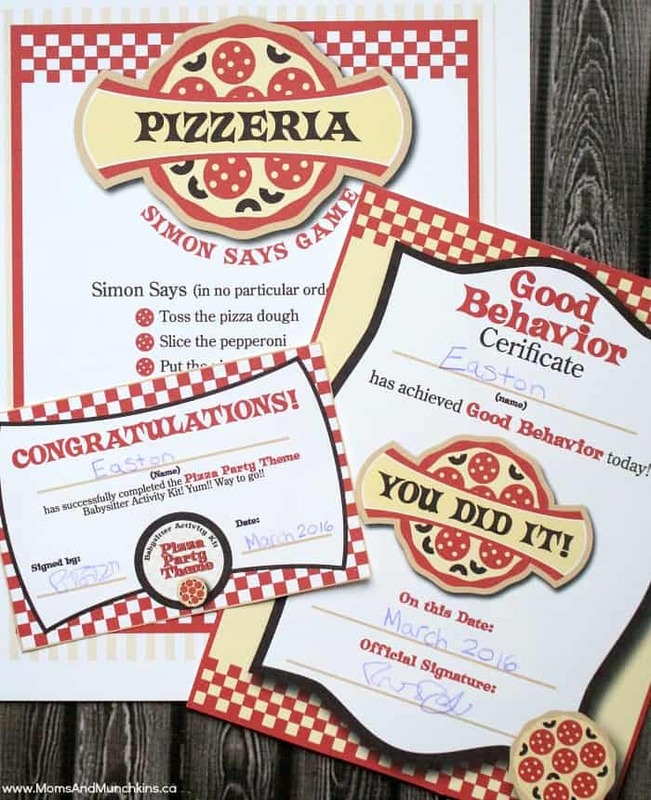 Certificates – this kit has a certificate for Good Behavior that the babysitter can fill out at the end of the day. It also comes with a Congratulations certificate for completing the kit. 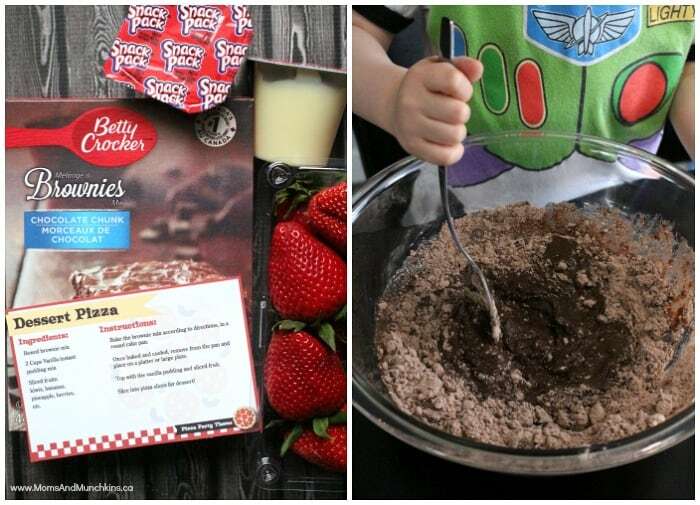 Recipe Cards – this kit comes with two easy recipes. 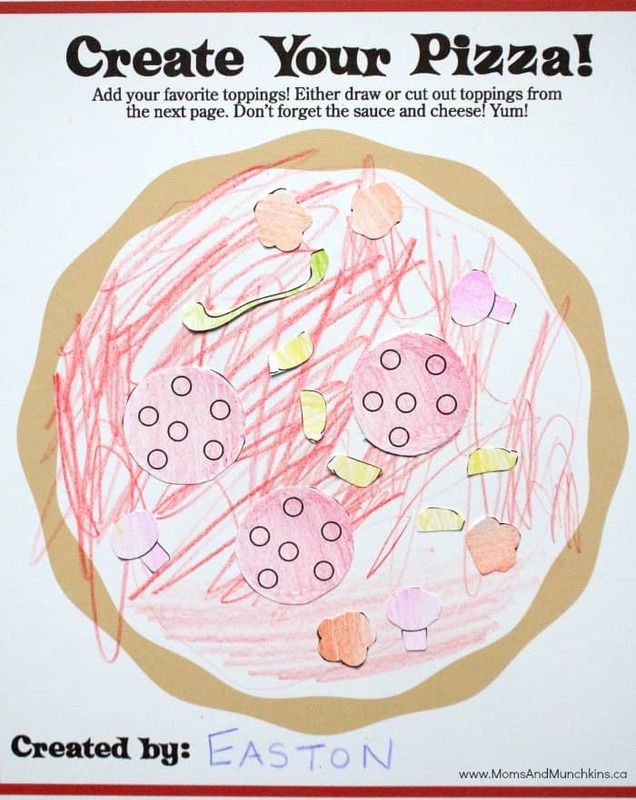 One for making a pizza snack and one for making a dessert pizza. Before cooking or providing food on a babysitting job, you’ll always want to check with the parents first to make sure the child doesn’t have any allergies. Also, it’s a good idea to do some of the prep work ahead of time like chopping the vegetables for the pizza or making the brownie so you don’t have to do any baking while you are babysitting. 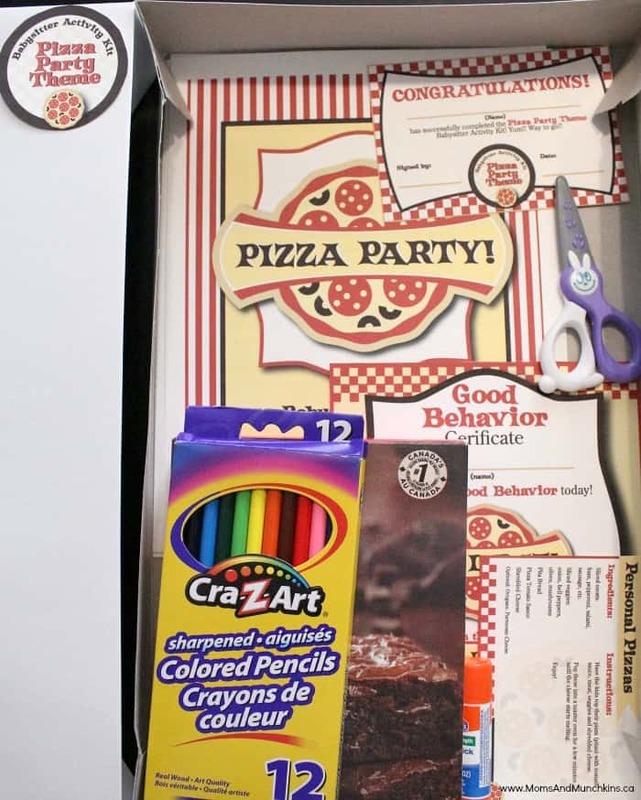 You’ll find this printable Pizza Party Babysitter Activity Kit in our Etsy shop. Have fun!